By Sunday night you will be stuffed, fed up, literally, and figuratively, with turkey. 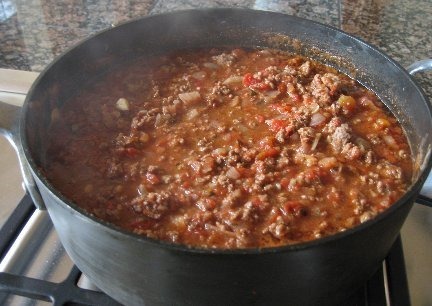 Instead of food fit for pilgrims, try food invented to be eaten in the wide open west — chili. Cook this dish on Saturday. Eat it on Sunday. However, I recommend dark beers or amber ales such as Negra Modelo or Anchor Steam for drinking with this dish and Budweiser or any American pilsner for cooking it. Alternatives for drinking include local western favorites such as Moose Drool or Black Butte Porter, and regional amber ales like Alaskan Amber or Fat Tire. Do not cook with “light” beer. It’s a very bad idea! Your dinner guests will not forgive you. In winter overnight temperatures on the Arco desert can plunge to -20F or more. The men and women running the reactors couldn’t drink beer, but they did have coffee. It’s still that way today. This is “2nd day chili.” That means after you make it, put it in the unheated garage to cool, then refrigerate it, and reheat the next day. The flavors will have had time to mix with the ingredients, and on a cold Idaho night what you need that warms the body and the soul is a bowl of hot chili with fresh, hot from the oven cornbread on the side. 1. Chop the vegetables into small pieces and brown them in cooking oil. Add 1 tablespoon of cooking brandy near the end. Drain thoroughly. Sprinkle chili powder, salt, pepper, to taste on vegetables while they are cooking. The onions should be more or less translucent to be fully cooked. 3. Combine all the ingredients in a large pot. Be sure to drain the beans, and tomatoes before adding. Simmer slowly for at least one-to-two hours Stir occasionally. 5. Reheat the next day. Garnish with shredded sharp cheddar cheese. Serve with cornbread. Thanks for the recipe. I’ll substitute tofu crumbles and vegetable broth for the meat-based products; it works for me. The beer and cooking sherry are new to me but should make it more interesting. I’ll be on the lookout for Moose Drool but I somehow doubt I’l find it in South Florida. Best wishes for the Holidays; Ed.